This page also serves as a discography of sorts. Extremely limited/one-off items may or may not be missing. To celebrate their 2002 "International Cooperation Tour" together of the western USA, Mono Pause teamed up with brilliant Finnish trio Aavikko for a split 7", wherein each band covers a song by the other. 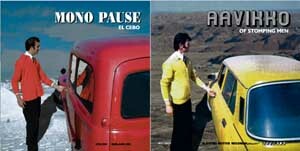 Mono Pause chose "El Cebo" from Aavikko's 1997 super-LP, Derek! (on the Bad Vugum label), entirely re-working the arrangement into a typically Pause-damaged hybrid of approaches. Aavikko, for their part, grabbed "Of Stomping Men" from the Peeping Through the Listen Hole LP and ran with it... far in another direction. So far, in fact, that the discerning listener might think it's not a Mono Pause cover at all, but a different composition entirely. Ambitious and crazed maxi-length compilation 7" record finding Mono Pause's vinyl debut, "Brief Lallation", alongside out-groups Ruins, Flying Luttenbachers, Melt-banana, The Molecules, Vacuum Tree Head, and Moe! Staiano (who's DKM label issued this 1998 disc). Every contribution is quite outrageous (including Ruins' infamous "Prog Rock Medley"). A 1000-copy limited edition. Alter-ego NEUNG PHAK creates and reprocesses musics from Thailand, Vietnam, Cambodia, Laos, Taiwan and West Oakland on their debut full-length release of 2003. 50 minutes of high-energy sounds as brought to the world via Seattle's Abduction label... from "radio hits" to Thai "morlam" psyche-improv and back, but minus the cost of the air fare. Off-world music. Very first missive sent forth by Mono Pause was found on this now-deleted 1993 double CD from RRRecords (which has the dubious distinction of listing a submitted track by the group Negativland... but it's not by Negativland at all). "Come Into The Future" is a melancholy, all-tape-sourced tune created in large part from the sounds of a 1937 World's Fair promotional film. This cut is not currently available elsewhere. An entirely improvised, monaural photo-cosmic seascape, this playful and primitive release highlights a fertile period of spontaneity for Mono Pause. An "official debut" recorded in almost-unedited sessions in 1995 and 1996 on a room-full of instruments and devices. Foamy squalls, drones, and lots of bumpy textures to run fingers across. Originally issued on cassette in 1996, this CD-R edition adds a strange and spontaneous 1997 live performance in stereo by a Pause-trio configuration for an audience of two uninvited guests who happened across the studio during a rehearsal. Two brothers, known as The Twelve Steppes (Gergis M and Gergis E of Mono Pause) made a pilgrimage to a suburb of Detroit, Michigan to visit family and eke out a living in the dead of winter. From their experiences came this amazing 1997 diary/rant/observation in sound and read-along magazine form. Mono Pause contributes several pieces of music to this melange of cut-ups and songs, intricately-designed with much use of "field recordings" from the suburbs. A dadaist ethnographic commentary on middle-U.S. society and culture, complete with regional meal recipes. Only available as a non-announced bonus inside the first twenty or thirty copies distributed of the Peeping Through the Listen Hole LP (though orders of the LP placed through this web site may very well still include it). A slightly edited improvised live recording from 1995 divided into four bite-sized chunks and packaged inside a hermetically-sealed sandwich bag to retard spoilage and maintain flavour. Mono Pause's 2001 contribution to this issue of Cool Beans! magazine was composed for the project. "Discs and Lisps (1982 version)" doesn't seem to jibe with anything at all in Mono Pause's recorded history and incited violence against band members in many cities on the 2002 tour. Mono Pause emits two contributions to this fine benefit CD set. "Why Am I In Life?" is the band's premiere recording done entirely in German, in an attempt to tap into the burgeoning Alt-Deutschland scene. It is a re-recording of "Why Did You Create Me?" from the upcoming Same Zero in the Face Mono Pause album. "Look Thong 8" is an extremely miniaturized example of the Thai Look Thong genre, as rendered by Neung Phak. When brilliant Swiss art-situationists Etoy were slapped with a ludicrous trademark infringement lawsuit by the now-defunct on-line retailer Etoys.com in 1998, a bunch of groups and musicians jumped to contribute tracks to this CD, which was sold to help defray Etoy's legal fees. Mono Pause's contribution is "At The End of Yours" (same version found on the Peeping Through the Listen Hole LP). Pause members Porest and The Jet Black Hair People also contributed cuts. The entire theme of the record is "children's lullabies", rather loosely defined. A glimpse at some of the earliest-known recordings of the group. The bulk of the cassette is edited from the first Mono Pause live radio performance, done on the fourth of July of 1994 on Berkeley, CA's KALX FM. A heavily source-tape based set features a live broadcast of Ronald Reagan's second attempted assassination, John Wayne rubbing shoulders with Libertarian zealots, police intervention, the real CNN news theme and much more/less. Excerpts from a follow-up performance on San Francisco's all-Jesuit KUSF FM and a wrap-around multi-receiver sound interception round it out. Debut release originally handed out to friends of the band in 1994, this cassette attempted to round up the "highlights" of the first year of the group and contains the earliest documented versions of material which would surface on future releases, a pattern which continues to this day. Pause will eat itself and often does. This tape was withdrawn from circulation and hasn't surfaced in a long, long time. It may not be purchased or bartered for though an early copy was once spotted on a popular auction web site with bids in excess of $1,400. Originally made for the International Cooperation Tour of 2002, this "fork and a bucket" design on heavy 100% cotton depicts rotund everyman being menaced (?) by a malevolent chorus line of identical eunuchs. Please specify design and size when ordering.